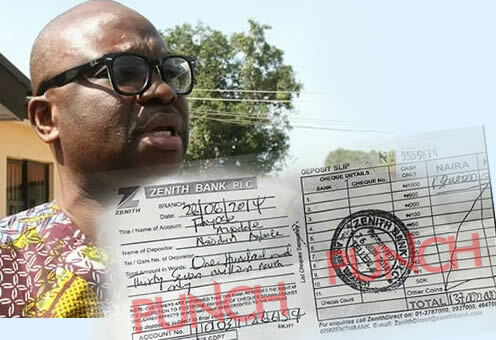 Justice Olukayode Adeniyi of the High Court of the Federal Capital Territory in Maitama, Abuja, will on July 19 (Tuesday) deliver judgment on an application by an ally of Governor Ayo Fayose of Ekiti State, Abiodun Agbele, seeking bail from the custody of the Economic and Financial Crimes Commission. Agbele was arrested by the EFCC on June 27 and has since been detained for his role in the handling of over N1.2bn on behalf of Fayose during the Ekiti State governorship election in 2014. The money found in Agbele’s bank account was said to have been part of the N4.7bn that was siphoned from the imprest account of the Office of the National Security Adviser. Justice Adeniyi fixed next Tuesday for judgment on Agbele’s bail application after listening to his lawyer, Chief Mike Ozekhome (SAN), and the opposing arguments against it by EFCC’s lawyer, Mr. A.A Akoja. Ozekhome urged the judge to grant his client bail “either in self recognition or on very liberal terms”. He said the alleged offences for which his client was being investigated were bailable. He urged the court to strike down Section 293 of the Administration of Criminal Justice Act 2015, which gives a magistrate’s court the power to detain a suspect for a period of 14 days, subject to further extension upon an application by the arresting authority. Ozekhome insisted that the said provision of the ACJA was inconsistent with the superior provision of Section 35(5) of the Constitution, which he said prohibited the detention of any suspect for more than 48 hours before filing charges against such a suspect. He said, in his client’s case, the EFCC after arresting him (Agbele) and detained him in Lagos on June 27, waited for 72 hours before obtaining an order remanding the suspect from a Chief Magistrate’s Court in Ogba, Lagos, on June 30. This, he said was a breach of his client’s fundamental rights. He said the EFCC further committed another alleged illegality by “surreptitiously” approaching a Magistrate’s court in the FCT, Abuja, on July 13, to further detain his client after the EFCC had been served with the processes of “this suit”. The suit before Justice Adeniyi was filed on July 11. Ozekhome added, “They agreed that they were served on July13 with the processes of the instant case. “They ignored my lord. They still insulted the judge by running back to the magistrate’s court to obtain another order. He urged the court to grant N500m compensation for the alleged breach of his client’s rights by the EFCC, and other prayers sought by his client. But in opposing the bail application, EFCC’s lawyer, Akoja, said the suspect was not entitled to any compensation. He said the commission never breached the suspect’s rights as his (Agbele’s) detention was backed by court orders. He said contrary to Ozekhome’s contention, the provision of section 293 of ACJA was not in conflict with the constitution. He also maintained that by virtue of Order 2(1) of the Fundamental Human Rights Enforcement Procedure Rules 2009, the suspect could not validly complain before the Abuja court an alleged rights violation that occurred in Lagos. He added, “We have deposed that he will jump bail. So much has gone through him; he is not willing to stay. “If we have the backing of the law, and facts, my lord will not hold otherwise that we breached his rights. “The respondent (EFCC) will not just pick any person on the streets. “The applicant has not placed sufficient facts before the court to warrant the granting of his prayers. “If he is not entitled to anything, he cannot be entitled to apology. A man whose hands are soiled, can he benefit from his own illegality? The judge fixed Tuesday for judgment.